You want to be a median of these two types of sellers, because it allows you to maximize profits from the things you’ve bought at buylist prices, avoid fees from eBay and TCGplayer, and get paid on the same day that you sell the cards. 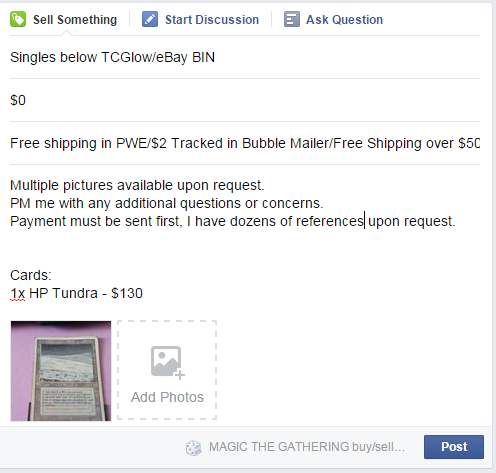 Today, I’m going to show you how to create a proper Facebook ad for buying and selling cards at a reasonable rate. For the love of Pharika, don’t be any of these people. If you are one of these people, you’ll learn that changing your prices and listing methods will prove fruitful. Each of these individuals has at least one thing wrong with how they created and priced their list of cards. In the first post, we see someone looking to move a pretty high-value collection, if he has what he says he does. Revised duals, foil fetch lands, and staples. What duals? What fetches? I have no idea. There’s no picture, no list of cards, and no document to reference. He’s only willing to produce a list for those who are interested, which is an immediate turn-off when considering the price he’s asking. Five percent off of TCGplayer low is a price that I would sell singles for out of my display case, or if I was trying to piece out a collection over time. To ask for a number like that when selling an entire collection at once is simply unreasonable. For these reasons, his post had exactly zero comments or interested parties when I saved the picture. Well, at least we have a list to work with here. This person has linked to a Google document, so we can see what cards exactly we’re dealing with, and how much each of them costs. He’s looking to sell everything in order to purchase a car, so there’s clearly a bit of a hurry to move everything at once for a lump sum. The problem? Ten percent off of TCGplayer mid (which I’m assuming he used for pricing based on my quick look at the document) is not exactly a deal that we’re looking for, and it’s sure as hell not going to get him any bites. If his “firm” became “less firm,” I asked him to let me know and send me a message, as I’d gladly pay $1500 to $1700 for the whole thing, and PayPal him the money today if he provided enough tracking and shipping confirmation. Lastly, we’ve got this carefully typed out list. This is only about 25 percent of the total cards that he carefully typed out, but I think you can see a pattern of problems here. First of all ,”Scarcity games” doesn’t exist, so I have no idea what his cards are priced at. Then there’s the issue of him painstakingly listing every single bulk rare on his list, in an attempt to make it look like his list is more valuable than it actually is. Near-mint bulk rares are worth 10 to 12 cents each to any buyer who would be interested in picking up an entire collection, nothing more. This rule doesn’t specifically apply to Facebook buying and selling, but more to the world of Magic: The Gathering finance as a whole. If we’re looking to sell cards, we will get paid a varying amount of money depending on the amount of work we put in. If we want to appear to be a reputable seller via Facebook and get paid approximately what our cards are worth, we want to put at least a bit of effort into our listing, and make it as easy as possible for the buyer to purchase our items without asking an infinite number of questions. This means that every item should have an associated price tag, and not a lazy listing like, “Everything is ten percent off of TCG low,” because that just makes more work for your potential customers. Now this is an example of a much better listing. The cheapest copy of Lion’s Eye Diamond on eBay right now is $68, and the lowest priced near-mint copy on TCGplayer is $72. Putting his at $60 almost guarantees that someone who was already eyeing (heh) one will gravitate towards this deal, but it’s also above the “liquidating these because I need rent money” pricing so that the seller makes a profit. I only have a couple of criticisms about this listing that if addressed would serve to make the transaction easier for both parties. There’s no condition listed for any of the cards, so I’m not sure if I’m getting a great deal on a NM LED or an average priced HP copy where the back of the card has been sandpapered down. There’s also no info on shipping prices. Some people feel the need to charge $5 for tracked shipping in a bubble mailer, which would certainly take the sweetness out of that Mox Diamond deal. Now, let’s try to make our own Facebook post that is both comprehensive, simple to read, and priced smoothly enough to make multiple sales within a couple days of the post’s origin. First of all, we want to establish a rule of how much we’ll charge for shipping and how we’ll accept payment. I usually ship for free in a plain white envelope (PWE) for total orders under $20, unless the buyer specifically requests a tracked shipment of the small order, in which case I charge $2. You can create a PayPal shipping label from home with a printer for $1.93, and then buy bubble mailers for approximately $.07 each. Once we start getting over the $50 mark, I generally just start shipping for free as a courtesy, and to encourage buyers to add a few more cards to hit that price point. As for payment, I only accept PayPal, and I always ask for the money upfront. I have enough references to solidify my position as someone who’s not a ripoff artist. While I’ve lost a couple of deals over this, I’m not willing to ship another party cards only to have them be unable or refuse to pay. If you’re just starting out selling via Facebook, you might have to accept shipping the cards out first if you don’t have enough references. Just be sure to actually confirm that the other party has real references, and that they’re not just sending you a list of names, by waiting for replies. Payment via gift is the preferred option, because we don’t have to deal with that little three-percent fee that comes attached for the goods and services option. Other than the fact that it’s yellow and looks like someone took out a cigarette and smoked directly onto it over a period of time, it’s still a sleeve-playable Tundra. It’s a dual land, and won’t ever see another printing. The cheapest heavily played copy on TCGplayer at the time of this writing is listed for $146 shipped, so I would probably put it on Facebook for somewhere around $130 if I wanted to get rid of it. While this is close to the “ten percent off of TCGplayer low” that I criticized the above seller for citing, this is the price of an individual dual land, and I’m not pricing my entire collection at this looking to unload everything. For contrast, let’s look at something that’s scheduled to be reprinted. In contrast to Tundra, the cheapest Splinter Twin available is $19 on TCGplayer, and I would list mine on Facebook for closer to $13 or $14. The highest available buylist for Twin right now is $12 if I wanted to sell to ChannelFireball, and I’m predicting that Twin drops down to $10 or $12 a few weeks after the reprint in Modern Masters 2015. 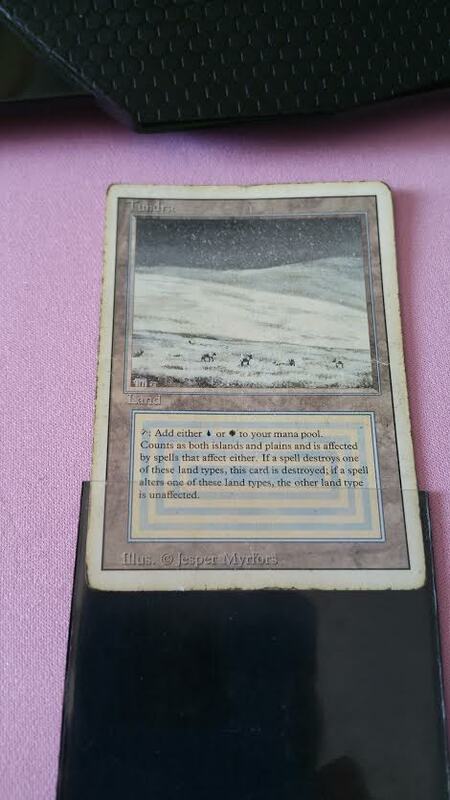 I’d rather sell it to someone who is looking to build the deck immediately instead of buylisting to CFB. In both these cases, note that instead of glancing over a pile of cards and saying “ten percent off TCG low for everything,” I’m going through each card and determining a value that would be beneficial to both me and the buyer, depending on the future of the card. 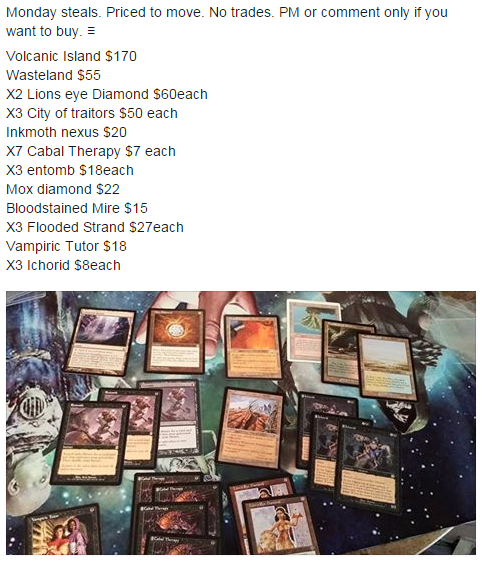 If you’re planning on buylisting a bunch of staples in the future, you might want to look at the prices that you’re willing to accept and consider selling them on Facebook. Instead of spending time alphabetizing, set sorting, and scouring multiple different buylists for the right price, we can make this a lot easier. Add a small percentage to that number that the store offered, list some rules for shipping and payment, add a couple of pictures of the collection, and then wait for some replies. And there we have it! This is obviously just a very basic template, but it conveys the message quickly and can be customized to add more cards easily. We made sure that we were beating the current market price to move product quickly, established shipping and payment in advance so that we don’t have to waste time answering questions about it, and we’ll get paid today if someone’s interested in the cards. One final note when making posts across multiple groups, though, is to wait at least a couple days after posting a listing in a single group . You don’t want to spam the feed and get kicked out. Good luck! In other news, Abrupt Decay has started creeping back up on MTGstocks Interests. It’s only up by five percent, but I fully expect this to be a $20 card sooner rather than later. If you need copies now, I think now is the time to buy, and they’re still great trade targets. Remember that almost anyone building a Tarmogoyf deck is going to need these, and I don’t think it’ll be getting a reprint soon. Great read. I do most of my transactions through FB. However, you mention that shipping through PayPal is around $2.00. But then say use Gift as the payment option. Doesn’t Gift remove the option to buy shipping from PayPal? My last option short of going to the post office if I want to ship from home is to use USPS.COM where only Priority service is offered at $5-$6. For a $50 purchase I’d only pay $1.5 or so for fees but be charged $2.00 for shipping = $3.50 versus if I accepted a gift payment and payed $5-$6 for the USPS.COM option. Otherwise I get to stand in line at USPS for a small savings = not worth my time. Are there other shipping methods with tracking that I can look into that don’t cost a monthly fee to subscribe? The gift option at least removes the buyer’s protection if the cards never show up, it’s like handing over cash. For any significant amount of money a lot of people are skeptical to use it if they don’t personally know the seller. Hope that helps with skipping the post office. Tried to trade via Facebook, but being from Germany seems to be a reason not to sell to me. Can’t find a TRADING group in Germany on Facebook. Yeah, I’m lucky in this situation being from the US. I don’t know anything about the foreign market but it seems like it would definitely be a pain. At least the fees on MagicCardMarket are lower than here in the US.